1. Peel and slice the avocados and then mash in a small bowl. 2. Squeeze the lime juice into the mashed avocado and blend by hand until evenly distributed. 3. Chop the fresh cilantro and mix into the guacamole until evenly distributed. 4. Optional: Create a Veggie Face by slicing two olives into the shapes of eyes, using one grape tomato for the nose, and chopping the bottom of a colorful pepper for the mouth. 5. Serve immediately or refrigerate. I'm totally addicted to guac and LOVE getting my supplies at Aldi! It's my new favorite store for great produce at an awesome price! Yummy guacamole! I love that there are only 3 ingredients and it's so easy to do. That is a cute idea. I always add lots of garlic to my homemade guac. It gives it a nice kick. My mom is a HUGE guacamole fan and never really knew how to make it. She lives down the street from an Aldi's, this is is a marriage made in heaven! She will LOVE this recipe! That looks delicious. The only thing better than guac is guac that's easy to make. I have an Aldi by my house.Aldi has the best produce and variety of cheese.It also has great prices. Yay for guac! I can't wait to give this recipe a try. It's so simple! I love homemade guacamole with fresh cilantro. It just adds a great kick to it! Great easy recipe! We eat a lot of avocado at our house so this recipe is on the menu this week. Thanks!! Love the simplicity of the recipe. And the face is cute. I love guacamole but have yet to have my kids try it. Thanks for the recipe now I can make it at home. This looks like a delicious and healthy dip. I will have to make some to try. I love the happy face. I love guacamole but have never made it myself except a time or two. I definitely need to make it more often. I LOVE your cutting board, too! Guacamole makes so many Mexican dinners better. I have to try this out and I love the cute face! That's a cute face! Unfortunately the face would last about three second in my house before it would get demolished by chips! I love that face! I am going to try this recipe out! We have made Guacamole before and the kids loved it. I love that I can make it not spicy for them, and my youngest loves to mash up the avocados. I am going to have to make a face for the kids next time. i am addicted to guacamole...i love your creative idea. too cute. The veggie face is hilarious, what a great addition. 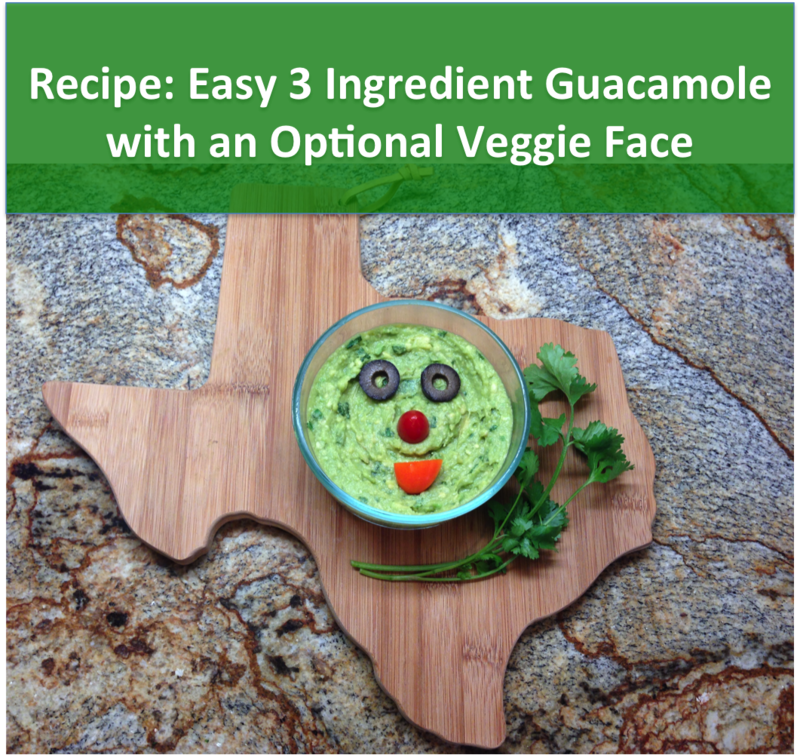 It teaches kids that Guac can be fun too. Aldi's makes mixing it up easy. I need to remember to hit Aldi up! I forget that they have such awesome prices. Looks so easy to make. I might have to try this.